Treasures of South Florida Libraries. The Johann Fust Community Library. With the Judgement Scene. Made for a lady called Ta-Per-Asari [She of the House of Osirio]. Date: Late Ptolemaic period to early Roman, First Century B.C. to First Century A.D. Papyrus fragment written in hieratic. The Johann Fust Community Library. Boca Grande, Florida. The Johann Fust Community Library is named after Johann Gutenberg's successor and the first successful printer and publisher. Fust lent Gutenberg money to produce books. Gutenberg was not able to repay the loan, and Fust claimed his equipment as collateral. Fust then began printing with the assistance of Peter Schoeffer, who had been an apprentice to Gutenberg. Fust and Schoeffer were the first printers to put their printer's device in a book. Mr. and Mrs. Roger Amory helped to found the Johann Fust Community Library in the 1940s. They escaped the harsh Boston winters every year in Boca Grande and wanted to help the small town. The Amorys set up an endowment, and the library was incorporated in December 1948. The library building, situated just a block from the Gulf of Mexico, opened in 1950. Besides an enclosed stacks, office, and a children's reading room, the library also has an open air loggia and garden. The doors to the library are copied from those of a mosque in Constantinople, and the stack doors are from eighteenth century Japan. Above the library is an apartment that is rented to winter visitors, and the income helps to supplement the library's budget. Mr. Amory, who was also a book collector, left his collection to the Johann Fust Community Library. Much of it was later sold, but a few treasures related to the history of the book remain. Book of the Dead. With the Judgement Scene. Made for a lady called Ta-Per-Asari [She of the House of Osirio]. Date: Late Ptolemaic period to early Roman, First Century B.C. to First Century A.D. Papyrus fragment written in hieratic. The Egyptian Book of the Dead was an illustrated manuscript of over one hundred and fifty burial spells written on sheets of papyrus and placed with the dead. The Book of the Dead was thought to guide the deceased through the dangers of the underworld on their way to the Field of Reeds, the Egyptian heaven. Copies exist dating as far back as the mid fifteenth century B.C. and the text has been traced back to wall carvings from the twenty-fourth century B.C. and in oral tradition to 3,100 B.C. By the first century A.D. the text and imagery were standardized. Selections of the Book of the Dead spells were made appropriate to the interests and beliefs of the deceased. This fragment shows four specific spells and the Judgement Scene done for Ta-Per-Asari. The text is written in hieratic, a cursive script derived from hieroglyphics. On the lower right is spell 89. This spell allows the soul to rejoin Ta-Per-Asari's corpse in the realm of the dead. The drawing shows the human headed soul, usually carrying a shen, a symbol of eternity, hovering over her mummy. In the top right corner is spell 91. This spell is used for preventing Ta-Per-Asari's soul from being restrained in the realm of the dead. The human headed soul is shown flying before Ta-Per-Asari who is walking to her tomb. Between them is an offering-table topped by a lotus. In the center bottom is spell 93. This is a spell used for preventing Ta-Per-Asari from being ferried over to the East in the realm of the Dead. The deceased, usually holding a scribe's palette, sends away the ferry-boat in which the ferryman sits with his head turned back. Shown in the top center is spell 100 [also known as spell 129]. This spell makes a soul worthy and permits it to go aboard the Bark of Re with those in his suite. The illustration shows Ta-Per-Asari poling a boat, containing the phoenix and a falcon-headed sun-god, towards Osiris, God of the Dead, who stands before a djed-pillar, symbolizing the town of Busiris, a city in the central Delta sacred to Osiris. 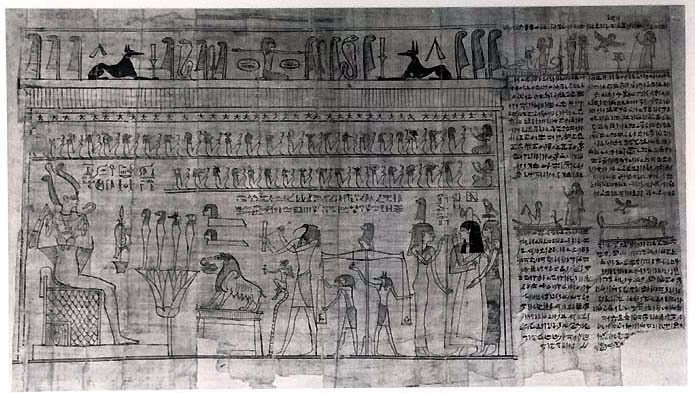 The large panel on the left shows the Judgement of the Dead scene, which appeared in every Book of the Dead. In this scene Ta-Per-Asari watches as her heart is weighted against the ostrich feather of righteousness, which also represents Maat, the goddess of truth, justice and cosmic order. Anubis, the jackal-god of embalming associated with Osiris, checks the accuracy of the balance. Thoth, the scribe of the gods, shown as a baboon, stands ready to write down the result and Ammit, the hybrid monster, waits to gobble any heart weighed down by sin. The Judgement of the Dead includes several spells as well. Spell 125, known as the "Declaration of the Innocence," shows Ta-Per-Asari declaring to a tribunal of forty-two gods that she is innocent of a series of specified sins, which in Egyptian belief covered every conceivable kind of wrong. The sins are represented in the frieze above the Judgement of the Dead scene. Bible. Latin. Germany. Fifteenth Century. Biblia Latina. [Mainz: Printer of the 42 Line Bible, Between 1454 and 1455?, not after 1456] Also known as the Gutenberg Bible. Johann Genfleisch zum Gutenberg was a master goldsmith who began to experiment with the making of type to print books sometime in the 1440s in Mainz, Germany. European books were written by hand but the increase in literacy, the growth of business, and a demand for easier access to information, created a demand for a quicker, cheaper method of producing books. By 1450, Gutenberg was borrowing money to work on his printing experiments, and somewhere around that time he began to print books. Gutenberg's most famous book is a Latin Bible of 42 lines printed in a folio edition of 1,282 pages in two columns with spaces left for handwritten initials to be added. The actual date of printing is not known but the book was in existence by 1456 when a copy now known as the Mazarin Bible was dated by hand, August 15, 1456. Gutenberg may have printed as many as one hundred and fifty copies of the Bible on paper and thirty-five on vellum. Many were destroyed over the centuries and today only twelve are left on vellum, of which four are complete, and thirty- five exist on paper, of which seventeen are complete. In the 1920s a New York bookdealer, Gabriel Wells, bought a damaged paper copy, dismantled the book and sold sections and individual leaves to book collectors and libraries. The leaves were sold in a portfolio case with an essay written by A. Edward Newton entitled A Noble Fragment, Being a Leaf of the Gutenberg Bible.... The Johann Fust Community Library leaf is from that book. The text is from the Vulgate Bible and is part of what is now called Nehemias Book 5: line 11 to Nehemias Book 7: line 39. This book of the Bible was formerly known as Ezra 2 and is identified as such in manuscript at the top of the recto leaf.